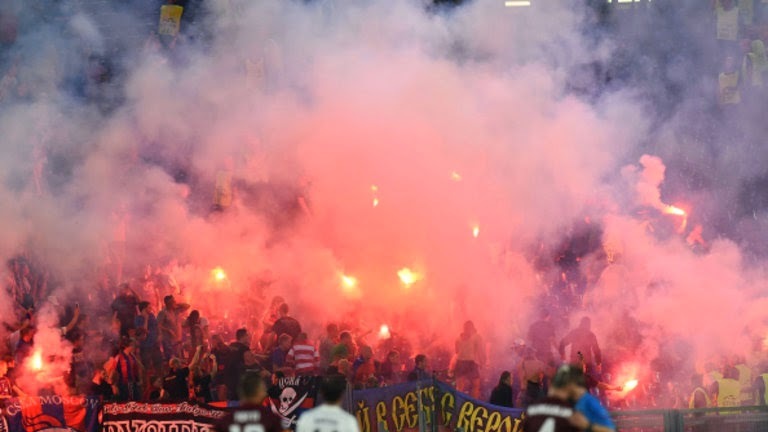 Following an ugly incident on Wednesday night, when visiting CSKA fans through flares at their Roma counterparts kicking off retribution and further violence, both clubs are facing sanctions. It's the second season in a row that CSKA have run afoul of UEFA, after a section of their support racially abused Manchester City during a 2-1 defeat last term and were punished by having a section of their stadium closed. The trouble in Rome this week began when CSKA supporters threw flares into the Roma section and these were quickly returned by the Italians. The Russians then attempted to storm the Roma end and were met with security forces who they clashed with. 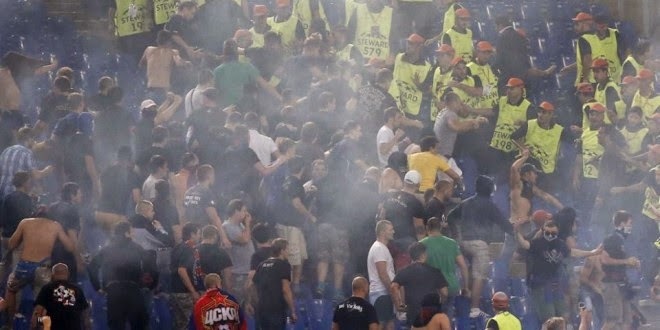 Following the match there was further fighting outside the ground and reports of at least two CSKA fans being hospitalized. "Disciplinary proceedings have been opened against: Roma for setting off/throwing of fireworks and missiles (art. 16 (2) (b) and (c) of the Uefa Disciplinary Regulations) and insufficient organisation (art 38 Safety & Security regulation),"
"CSKA for the racist behaviour of supporters (art. 14 of the Uefa Disciplinary Regulations), crowd disturbance (art. 16 (2) (h) of the Uefa Disciplinary Regulations), setting off/throwing of fireworks and missiles (art. 16 (2) (b) and (c) of the Uefa Disciplinary Regulations). "The case will be dealt by the Uefa Control, Ethics and Disciplinary Body." If either club, or both, are sanctioned by UEFA, it will affect their next Champions League group stage matches against Manchester City. Roma are due to play at the Etihad on September 30 and City will visit Moscow on October 21. The sanctions could include a reduction of tickets allocated to either club, fines to the club and/or other restrictions for supporters.